Hey Fantasy Football Fans, I’m The Fantasy Football Girl and this is AS THE LEAGUE TURNS – a weekly digest of the NFL’s biggest, baddest, and best drama. The show that doesn’t necessarily dig deep for stats, but does dig deep for dirt. There are always surprises and upsets in football. That’s part of what makes each week so exciting. As it turns out, Week 6 was no different. Perhaps the biggest upset, or at least the one that has most people talking, was the New England Patriots’ number one rated offense falling short – by just one point – to the Seattle Seahawks’ number one rated defense. Some fans were calling this match-up The Irresistible Force vs The Immoveable Object. Well, Immoveable Object fans – and players – are still cheering. 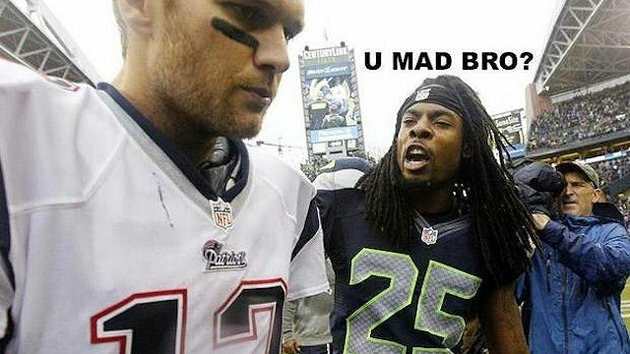 In fact, Seattle Corner Richard Sherman supposedly tweeted this image after Sunday’s game. Apparently, after much trash talking and jawing on both sides, Patriots QB, Tom Brady told Sherman to, “come see [him] after the game when they (meaning New England) won.” Yeah… you can bet Sherman went and saw him. The Seahawk has since deleted the Tweet, but I have a feeling he doesn’t need a picture to help remind him of the time he picked off Tom Brady in the 3rd quarter. Brady, on the other hand, probably forgets his whole day once he gets home and sees his wife. Seriously, how are legs that long?? You know when you see a baby and think that he or she has a face that only a mother could love? Well, the Cleveland Browns are a team that only a true fan could continue to root for. An annual embodiment of underdogs, the Browns are one of just four teams to have never made it to, let alone win, the Super Bowl. This year, however, things are looking up in Cleveland. They’ve got a great group of young receivers, a stud of a rookie running back, and leading this new and improved offense under center is a less than conventional first year quarterback. His name is Brandon Weeden and on Sunday’s game against cross-state rivals the Cincinnati Bengals, he helped his team earn their first victory of the 2012 season. That same day, he celebrated his 29th birthday. Yes, that’s right, he’s a 29 year old rookie. In 2002, at the age of 19, Weeden was drafted by the New York Yankees to play baseball. After a few years of knocking around the MLB, however, it was clear that he needed a Plan B. So, like all forward-thinking jocks, he enrolled at Oklahoma Sate University and decided to give football a try. Five years later, he’s making close to $400,000 and high-fiving the Dawg Pound. I wonder if his parents complain that he never went to law school. Anyway, it’s also good to know that everyone has a sense of humor about their aging QB. In the programs sold at Cleveland Browns Stadium this Sunday, Weeden was listed as being 129 years old. I gotta give it to you Cleveland; you always find a way to smile. 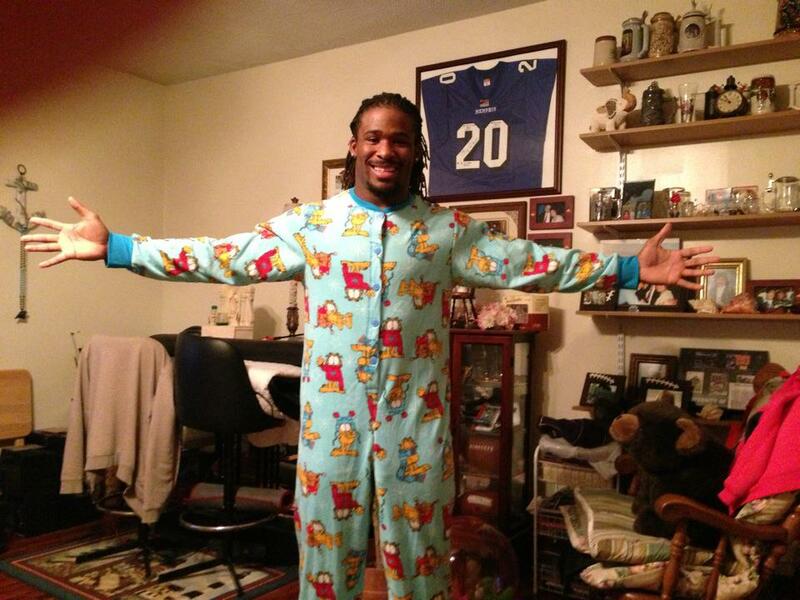 Running Back, DeAngelo Williams, sure seemed to be enjoying the Panthers bye week when he posted this picture of himself on his Facebook page this past Sunday. Apparently, Mr. Williams appreciates footie pajamas AND Garfield. Who knew? As both an owner of similar pj’s AND an Abu Dhabi enthusiast, I have to applaud Williams for showing his fans a softer side. That being said, I’d encourage him to rest up because he hasn’t scored a TD since Week 4… and in Week 7 he’ll face a Cowboys run defense which has only given up 4 scores on the ground. DeAngelo, I have a feeling you might REALLY hate next Monday. Thanks so much for watching. This has been AS THE LEAGUE TURNS, and I’m The Fantasy Football Girl reminding you to always WIN BIG.